-69% OFF on This Product 2019 : Today Only! As far as ladies concern everything as to be unique from others. So this jacket has the same quality which does not match with any other of its kind. This jacket idea comes from the famous TV show Almost Human which about a man who wakes up from a 17-month coma with some losses. Minka Kelly has played one of the main characters Valerie Stahl in this TV show and she showed up with this tremendous leather jacket. William Jackets bring the same featured jacket which is made with quality and 100% real leather stuff and it contains Viscose lining interior for your comfortable wearing. It is made with remarkable stitching. Minka Kelly Almost Human leather jacket has a brown color and had great style with lapel style collar which comes with snap button fastening feature. Valerie Stahl brown leather jacket has the full-length sleeve attached with open hem cuffs. It contains 4 pockets where two are a front zipper, and two waists jetted pockets are available as per the real jacket. This Almost Human Minka Kelly Leather Jacket grab my attention simply because of it decent styling and Dark brown color. Especially real leather-based makes it extra in comfort wearing. After taking this jacket I found that inside the description it is from Almost Human Serial. I have decided to watch that series because of my jacket. 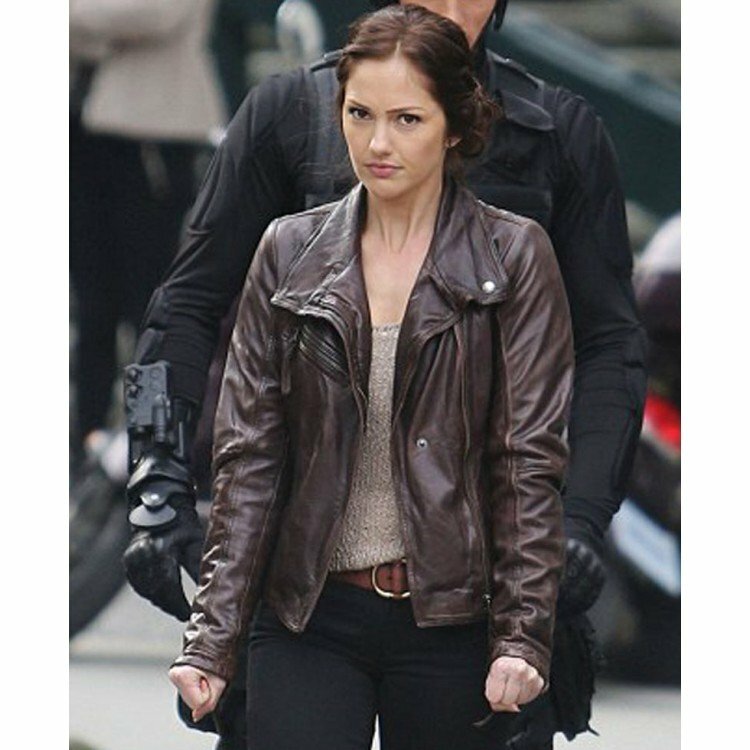 Almost Human Minka Kelly Leather Jacket was not easy to find with accurate featured but thanks to William Jacket which provides the same Jacket which I looking for. I am a big fan of Minka Kelly and purchased this Jacket by inspiring from TV show Almost Human. She Looks beautiful and stunning in this jacket. I love myself and also love to wear such things that attracted to people as much as I thought. This jacket gave me full proud feelings. Because I am a woman and I always praised those things who also admire the women power. Minka Kelly is one of my favorite actors and I like her acting in this drama. I got this jacket because of its brown color and its lapel style collar which comes with snap button fastening. Because I want to look different and to work different and this style is matched with my personality. Minka Kelly is the main character and she is as stronger as her character. She gives an inspiration through her drama. I love the serial and the second thing is a brown color which is my favorite color.These two reasons have attracted me to select the jacket. But I must say that I choose the right path to buy it. William jackets are the most trustable and admirable company in the leather field and I appreciate their work. Brilliant fast delivery is its main recognition. This human brown jacket can wear in a picnic, party or you can use it in casual events too. It totally comfortable for use its warm texture give us full hot inner side and after having this I have no need to use any other thing on it. My friends say that my choice is good and they trust in my buying. I refer these fashionable jackets for my friends and they all love to wear them with comfort.